Jugal Himal trekking is non tourist trekking trail in langtang region .Jugal Himal is the nearest mountain to the northeast from Kathmandu. 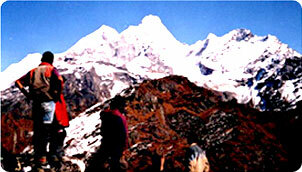 Jugla Himal trek is a marvellous trek through remote traditional Tamang villages and luxuriant forests. The drive from Kathmandu to Melamchi Pul takes about five hours. Then we ascend a series terraced and forested ridges. Jugal himal trek towards the holy lakes named, "Panch Pokhari" (five lakes), situated at 14,000 ft., is its another breathtaking attraction. Enjoy the tranquility of trails that offer superb mountain views, green Himalayan ranges, and running rivers with water falls. Only a few camping trekkers visit the jungal himal area because lodge or other shelter facilities are not available. Jugal Himal trek is special for trekkers who would prefer not to meet many other tourists or spend time in crowded villages. Himalaya journey Treks and Expeditions professional trekking operator arrange the Jugal himal trekking according to trekkers holiday schedule and wish. Day 01: Arrival in kathmandu 1334m, Himalaya Journey Treks & Expedition’s representative will transfer to hotel , Jugal Himal trekking briefing with officially arrangements. overnight at Kathmandu. Day 02: Sightseeing around kathmandu valley and preparation for Jugal Himal trekking. overnight in kathmandu. Day 14: Trek and drive to Kathmandu. Transfer to the hotel.